Labeling machine using Stretch Sleeve technology, applying labels made of linear lower density polyethylene (LDPE film, with elastic properties). The stretch label, which has physical and practical qualities , makes it very attractive to consumers and beneficial for different fields producers. Why choosing an Itapack Labeling? The environmentally friendliest and sustainable solution for R-PET and recycling operations. The sleeve can be applied on a wide range of plastic containers ( PET,PE,PVC, PP, HDPE), glass, metal barrels, drums . The containers can be empty or filled and wet or dry. Such as in humid production area, the stretch sleeve results an excellent labeling choice seen the container’s dryer is not required . Chemicals PET/ Hdpe bottles, cylindrical, square and rectangular shape, small & medium sizes. Drums, cans, and crates, medium & big sizes. The containers are labelled in continuous mode by the applying heads synchronised with the bottle’s transport conveyor. The sleeve application cycle is tailored to the specific container format to be worked. The adoption of a fully servomotor driven technology allows for high performances and the highest flexibility on format changeover. ITAPACK adopts the state-of- the art technology on multiple axis control available on the market (A&B, Siemens, Omron). Here below a range of models specially developed for application on PET and Hdpe bottles for small and medium sizes, covering a range of production speed from 3000 to 15.000 bottles per hour. 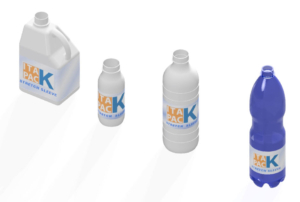 Itapacks range includes labeling machines able to run many containers’ types also big sizes and special shapes, different technical solutions are available on demand.